Our latest integrated wood heater design is the Convector Built-In. Designed with a one-piece, linear fascia and discreet, flush fittings it offers a sleek and minimalistic appearance to suit contemporary homes. 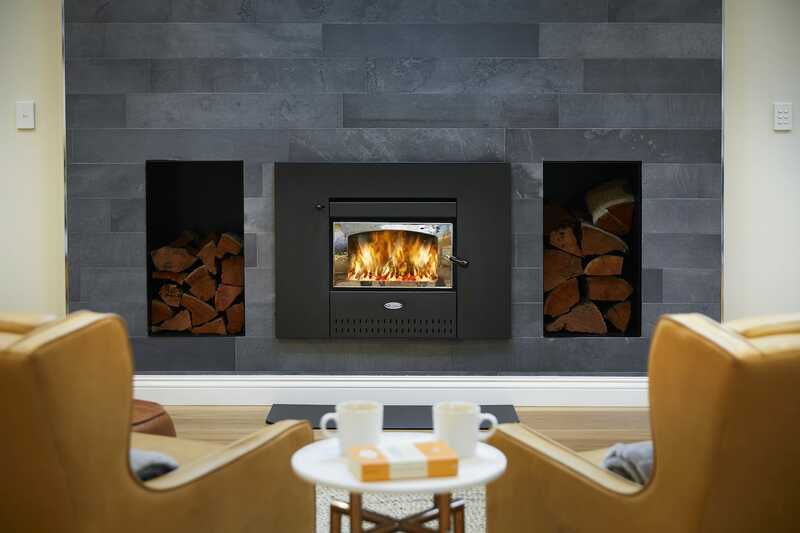 Yet don’t be deceived by its unpretentious appearance – this wood heater boasts impressive heating abilities, warming areas of up to 232m2, thanks to its over-sized firebox, large firebox opening and a two-speed fan. Flue Placement – Move the standard flue centre forward or back, to line-up with your existing chimney centre. Fan Power Cord – Position the fan power cord to suit the location and distance of the closest power point. The fan power cord can protrude from the left or the right side of the heater and can be extended to avoid the use of extension cords. Custom Chimney Covers – All chimneys are different and sometimes the standard chimney cover is too small. We will manufacture the correct chimney cover to suit your home. All Jarrahdale Wood Heaters are made right here in Perth, Western Australia to strict Australian Standards using locally-sourced steel. Our fireboxes are made using 6mm solid steel while all other components are 8mm solid steel. If you would like to know more about the Convector Built-In wood heater, please fill out the form below and one of our friendly staff members will be in contact with you as soon as possible.